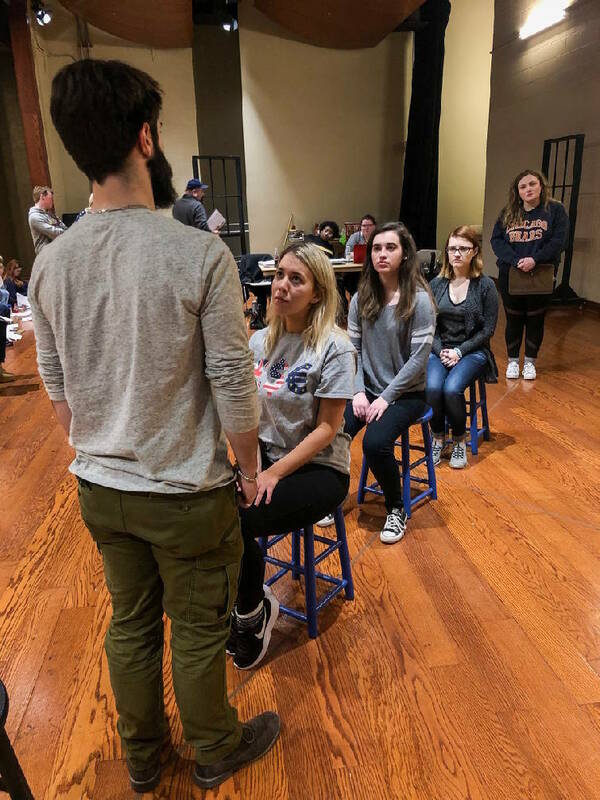 The University of Tennessee at Chattanooga's Theatre Company is stepping outside the box with its production of "Love and Information" by Caryl Churchill, a kaleidoscopic play of short scenes that address contemporary issues on knowledge, technology and our capacity for love. "Love and Information" will open Tuesday, Feb. 12, in 901 Lindsay event hall, and continue through Feb. 16. "'Love and Information' is a big container of ideas and emotions," says director Gaye Jeffers. "A giant suitcase of over 50 short plays with more than 100 characters played in our production by 11 actors." Those cast members are Bailey Braden, Autumn Hemmelgarn, Grace Holtz, Madison Parker, MarQuez Pierce, Tate Runyon, Kimberly Rye, Alex Walker, Linsey Watkins, Mikki White and Jessie Wright-Rudez. Jeffers' interpretation of the open-ended structure of the show led her to emphasize inclusivity and diversity in staging the production. Each actor portrays different characters, often outside the construct of gender or stereotypical relationship roles. "Love and Information" is the first play the theater company is doing in its series of shows performed while the university's Fine Arts Center is renovated. Jeffers is enthusiastic about having the opportunity for students to work outside of the traditional proscenium theatre. "Performing in 901 Lindsay puts the audience and actors inches apart instead of feet. The intimacy of this venue is sublime for this play," says Jeffers. The creative team also includes Adam Miecielica, set design; Chalise Ludlow, costume design; and Jeff Davis, lighting design and technical direction. Show times for "Love and Information" are 7:30 p.m. Feb. 12-16 with an additional 2 p.m. matinee on Saturday, Feb. 16. Tickets are $12 for general admission, $10 for senior adults and students with valid student ID. Tickets can be purchased at the UTC Fine Arts Center box office, 752 Vine St.; by phone at 423-425-4269 or online at www.utc.edu/theatre. Advance ticket purchase is encouraged since seating is limited. Audiences are advised that "Love and Information" contains adult language.